Last weekend brought many of you back to the theater for the first time since our little issue with the weather. It was truly humbling to see the theaters at capacity and all of your photos of our little red balloons that we snuck around the place. We hope you enjoyed our lineup last weekend and we think you’ll enjoy the three new movies that we have for you this weekend. mother! 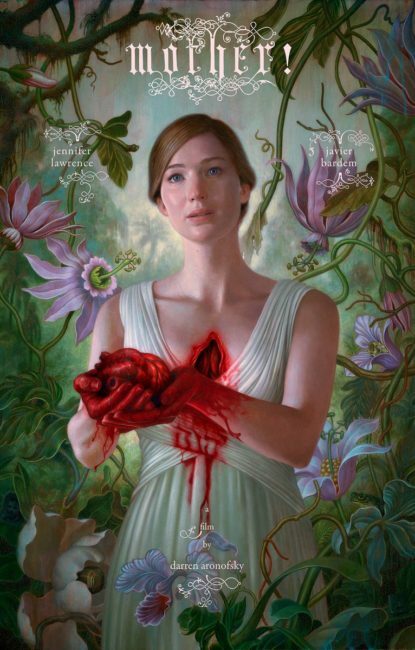 is our spotlight film for the week and it’s the newest film from Darren Aronofsky. You might know him from pictures like BLACK SWAN or THE WRESTLER, but we assure you you’ve never seen a film from him this intense or this extreme. It’s a rare treat to see a filmmaker throw caution to the wind and just go for it, and if the early reviews are any indication (Variety calls it “a hugely ambitious, brilliantly made movie”), this is one of those times. VICEROY’S HOUSE and BEACH RATS are two arthouse finds that we wanted to bring to the big screen. The former is a fascinating look at the end of British rule of India from filmmaker Gurinder Chadha (BEND IT LIKE BECKHAM) while the latter is a nuanced and powerful tale of male sexual discovery set on the outer edges of Brooklyn. These aren’t the movies you see at the top of the box office, but they are the ones you should check out to view the world through some fresh perspectives. IT is the only film from this week moving on after Thursday so be sure to make time in your plans to catch any of our current offerings before they end up in a storm drain somewhere. Next week comes our $2 Tuesday pick from GM Brian Jones: the ultra-violent Japanese classic BATTLE ROYALE. This film has inspired a wave of storytellers from Quentin Tarantino to whoever came up with The Hunger Games. The week after, we have THE APPLE ready to roll. This movie is so crazy we couldn’t even begin to describe it in words. Click on the title for the trailer and have a chair ready to sit down afterwards. Next week, we can say with pride that THE MADS ARE BACK! Come see TV’s Frank (Frank Conniff), and the voice of Crow T. Robot (Trace Beaulieu) from Mystery Science Theater 3000 as they visit us live at The Broad and riff on two different movies over two nights (9/19 & 9/20). We still have tickets available and they cover not only the event but a special meet and greet and autograph session with The Mads themselves. Don’t miss out!